Lace dresses, especially those with a raw edge hem, are everywhere this summer! These are right at the core of the hyper romantic trend we flagged as our favorite new trend earlier this season, and they've only gotten hotter since. They're perfect for dressy occasions like weddings, date nights, or in my case, a 10-year high school reunion dinner. The dress was a little low cut in front, which I knew when I ordered it, but thought would work since I'm lacking in the chest department. However, it did seem to gap a bit to the sides, so to be safe, I got two black pieces of elastic and hot glued them in place like a little built in bandeau. That not only kept the deep V in place, but tied in the black accessories I knew I'd be pairing it with. I would highly recommend this quick and cheap fix for anyone with a cut that's too low for comfort. Speaking of low, check out this cutout back! That was yet another reason to love the dress. My class reunion, where I wore this, was outdoors, so the back was nice and breezy. 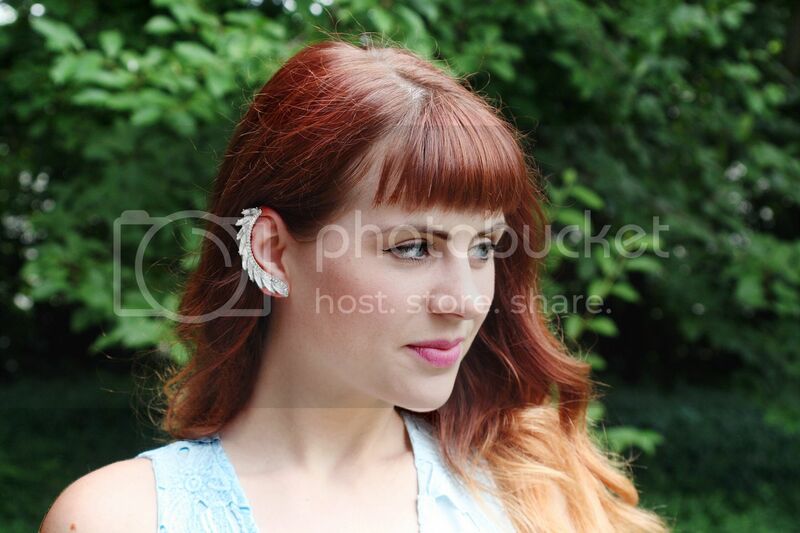 Ear cuffs are my new favorite earring for fancy occasions. They make such a statement without being long and dangly. With my hair down, long earrings might get lost, so these were the perfect statement-making solution. My hair is curled using the super easy Overnight Curls method. Black pumps and black vintage clutch tied in the black accent I'd added to the dress and made for more of a dramatic nighttime look. A silver leaf wrap ring is a whimsical statement piece that matches both the earcuffs and the dress. Are you styling any fun hyper romantic looks perfectly fit for summer? Aww, thanks so much, Laura!! Love your blog, too!